Like the mist swirling and dancing, dithering and then dispersing and fading away is leaving a magical feeling behind. This is how you feel at the Mist Club Lounge. Grab a Coca Rita or Bellini Sunset and let the orange and creamy texture slide down your throat warming your core. The cocktails in this lounge is like galaxy spilling from a bottle! 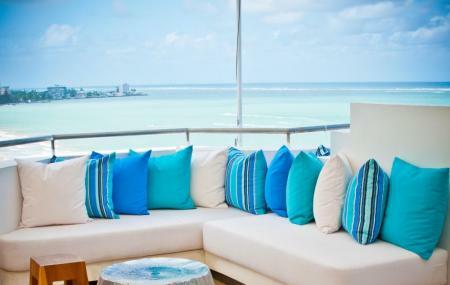 The music spreads delight and the panoramic view of the ocean glitters in blue and translucent white. This club is one of the most trendiest and prominent place to party in the San Juan Metro Area of Puerto Rico. This rooftop lounge comes alive at night when local and international DJ’s play music to get you into the perfect mood to party under the stars. The Mist has cocktails and special menus served in small plates which they call “signature” adding zest for you to enjoy with family and friends. They offer wonderful party packages which includes small plates you can share—prepared with fresh, locally grown ingredients. Mist has a skyline swimming pool. The views from the rooftop are striking and so peaceful, frozen in one beauteous postcard. Lounge in the day beds, look up at the clouds which are drifting along lazily against a perfect forget-me-not blue sky, or take a dip in the cool refreshing energising water and wrap yourself in a scented towel. While away a gorgeous afternoon under the awning or in a rooftop chaise lounge. Relax and indulge with a cocktail and light lunch. You can feel the cool tropical breeze sway in the air, alluring you. From the rooftop looking down, you feel as if you at the summit of a hill and the entire region is spread out below you. At night when the sun sets, the sand, the thicket and bushes rise to the same level and makes a uniform skyline at the horizon! The DJ’s spin a good mixture of music to suit all types of culture. In case there is a delay in getting your order, sit back and enjoy the view while waiting. They have package menu to choose from: Celebration $275; Splash $450 and Socializer $580. Packages do not include tax which is an additional 15%. Each bottle comes with a choice of 3 mixers. Local DJ's every Thursday to Saturday starting at 6:00 pm. Ladies Night on Fridays from 9:00 pm – 11:00 pm; complimentary Vodka Cocktails. How popular is Mist Club Lounge? People normally club together 15 Knots Kiteboarding School and El San Juan Casino while planning their visit to Mist Club Lounge.